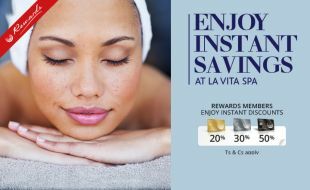 Garden Route Rewards cardholders are in for a treat at La Vita Spa. As part of an exclusive offer, Rewards cardholders can enjoy great discounts on any standard treatments*, every day of the week. 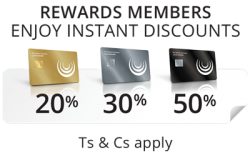 What’s more is that Rewards cardholders can use these instant discounts as many times as they wish. What’s more is that Rewards cardholders can use these instant discounts as many times as they wish. For queries or bookings, visit the La Vita Spa Front desk or call +27 44 606 5341. Once you have made your booking, print your discount voucher at an eHost in the casino and make sure to present it, along with your ID, when you go for your treatment. *Please note that the discount is only applicable to standard price treatments and cannot be claimed on any pamper packages, discount packages, monthly promotions, vouchers or retail products. The discount is only available to the Rewards Card member and is not transferable to anyone else. So come and visit La Vita Spa, right next to the Pinnacle Point Club House, and enjoy a scenic pampering. The discount is only applicable to standard price treatments and cannot be claimed on any discounted offers, pamper packages, discount packages, monthly promotions, vouchers or retail products. The discount is only applicable to the Rewards cardholders and is not transferable to anyone else. Bookings must be made prior to arrival directly with La Vita Spa. Discount vouchers must be printed from any eHost at Garden Route Casino. Discount voucher and positive form of identification (SA Drivers Licence, ID Book or Passport) must be presented upon arrival at La Vita Spa. An active card status is required to qualify for the discount for Black, Platinum and Gold cardholders.